Nobody brings a smile to children’s faces quite like Mickey. You can imagine all the smiles and joy to be found at a Mickey Mouse themed birthday party like this one, planned by Jodie Vandekerkhove for her son, Saul. Get ready to join the party filled with lots of polka dots, Mickey inspired decorations, a marvelous dessert table and a birthday cake that will knock your socks off! Jilly B Photography captured all of the fun. Mickey Mouse + Pirates of the Caribbean = one amazing birthday party combo. 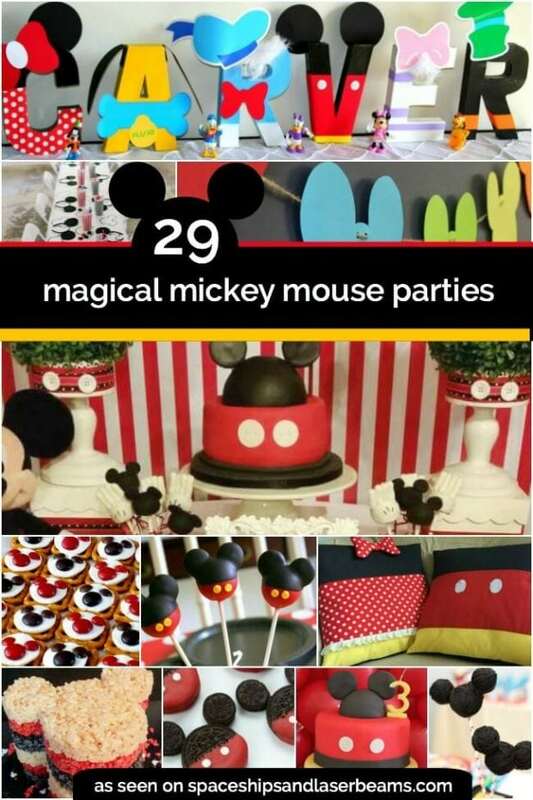 Add these Nautical Mickey Mouse Party Ideas to your next Mickey Mouse birthday party. A darling Mickey inspired dessert table stole the show. I adore the Mickey ears “happy birthday” banner, which could be replicated with black paper plates, paper and printed letters. Doesn’t it look amazing against the red and white polka dotted backdrop? It just screams Mickey Mouse to me. The black and white polka dotted table runner made from wrapping paper is a fabulous and economical way to dress up the tabletop, as are the oversized polka dotted balloons mixed with smaller red, yellow and black balloons. I love the displays of Mickey Oreos anchored in galvanized tins with chalkboard label “6”s reinforcing the birthday boy’s new age. The colorful tissue paper and Mickey glove cutouts are festive additions. Sweet Mickey cookies with chocolate chip buttons are another enticing dessert option. Best of all is the incredible Mickey Mouse cake; the detailing on the face is fantastic! With so many great activities to choose from, it would be hard to trump the fun, but I have a feeling a visit from “Mickey” may have done just that. The Mouse himself crashed Saul’s party. How cool is that? So many magical moments could be captured in front of the great photo backdrop. Polka dots, colorful balloons, pennant flags, and a birthday banner make it the perfect photo op location! I spy a lot of party guests beaming from ear to ear Jodie had such fun “Mouse-y” props on hand to make the photos just perfect. I especially love the kid-sized Mickey cutout. How fun for kids to poke their little heads through and say “cheese”. This was such a wonderful DIY detail. The dining table was decked out in bright balloons, activity sheet placemats, colored plates and red paper lunch sacks. Filled with fruit, drinks and granola bars, party guests had simple snacks to nibble on during the celebrating. Parties for kids are made so much more fun when great party games and activities are planned. Jodie had a plethora of activities that Mickey himself would surely approve of. Piñatas are always a great choice, especially when they are as cute as this Mickey shape; kids love scrambling for treats and trinkets. I love the ingenuity behind the budget-friendly toilet paper knock-down game. With simple letters affixed to rolls of toilet paper, a friendly competition was added to the celebration. Speaking of competition, check out the adorable “pin the Mickey ears” on the birthday boy game. This is a fun custom game that could be adapted for anybody’s party. So many magical moments could be captured in front of the great photo backdrop. Polka dots, colorful balloons, pennant flags, and a birthday banner make it the perfect photo op location. The favor table was full of colorful balloons, flowers, darling subway art and Mickey paraphernalia. The most adorable Mickey gift bags were filled for guests and included a pair of Mickey gloves, M&M cookies and an “It’s a Small World” ball. If you aren’t smiling after this party, you better go look at all of the happy pictures again. Jodie knows how to bring all the kids to the yard, thats for sure!